Lancia’s Ardea model was replaced by the Appia in 1953, which remained in production for ten years. Produced in three Series during its run, improvements along the way included a larger trunk, larger rear glass, longer wheelbase, more power, and a larger bench seat. 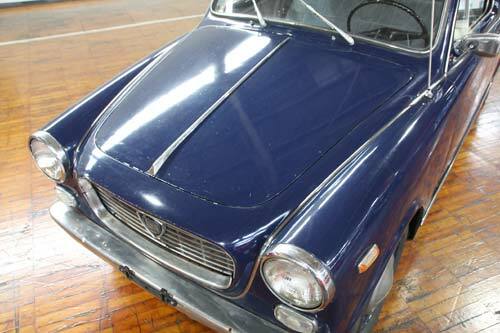 The traditional Lancia shield grille was replaced by a lower hood and a wide, horizontal “mouth” in the later Series 3 cars, as seen here. Common to all were other Lancia trademarks – a small-displacement, narrow-angle (10° in this case!) V-4 engine; it was the last model to use Lancia’s signature sliding-pillar front suspension. 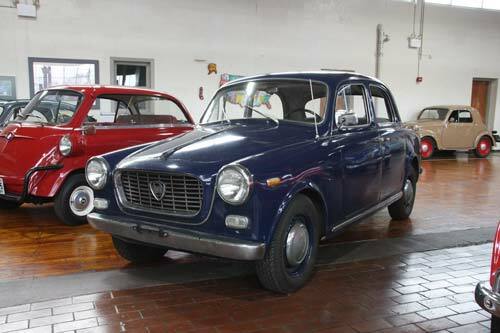 The Berlina (sedan) seen here was the most common style, but Lancia offered the Appia in van, pickup truck, and ambulance configurations as well. Additionally, carrozzerie such as Zagato, Pinin Farina, Vignale, and Viotti offered all sorts of special-bodied Appias – coupes, convertibles, and sports models were all popular. Lancia has had a long history of Motorsports, and the Appia was no stranger to success in the hands of privateers in the late 1950s and early 60s. In 59 international races, the Appia scored 4 overall victories, 19 class wins, 4 poles, and 12 podiums. Not bad for a 1.1 liter car! Friend of the Museum Anatoly Arutunoff raced his in the 60s with some success, competing in the 1964 Nassau Speed Weeks, and 2nd in class at Oakes Field, behind an Abarth-Simca 1300 Bialbero, but ahead of a Corvette, a BMW, and several Lotuses! As a manufacturer, Lancia enjoyed a long tradition of innovation: 1st monocoque construction, 1922; 1st complete electrical system, 1913; 1st 5-speed transmission, 1948; 1st all-independent suspension, 1st body styling in a wind tunnel; 1st V-4 (1922) and V-6 (1950) production engines. Sadly, the economic downturn in Europe and Fiat’s merger with Chrysler has diluted the brand, resulting in a change of focus. 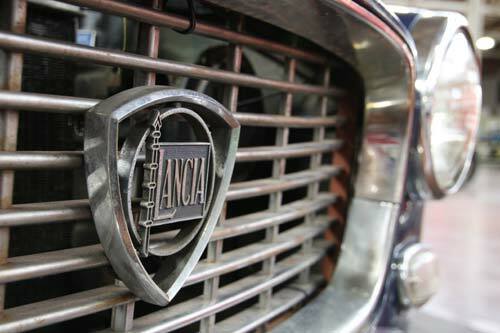 After June 2014, Lancia announced they will market cars only in Italy, pulling out of all other markets. Manufacturer: Lancia & C. Fabb Automibili – Torino S.p.A.